Almighty God, by whose grace and power thy servant Laurence didst triumph over suffering and didst despise death: Grant, we pray, that we, steadfast in service to the poor and outcast, may share with him in the joys of thine everlasting kingdom; through Jesus Christ our Lord, who liveth and reigneth with thee and the Holy Spirit, one God, for ever and ever. Amen. Almighty God, by whose grace and power your servant Laurence triumphed over suffering and despised death: Grant, we pray, that we, steadfast in service to the poor and outcast, may share with him in the joys of your everlasting kingdom; through Jesus Christ our Lord, who lives and reigns with you and the Holy Spirit, one God, for ever and ever. Amen. 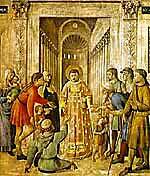 Laurence (or Lawrence) was chief of the seven deacons of the congregation at Rome, the seven men who, like Stephen and his companions (Acts 6:1-6), were in charge of administering the church budget, particularly with regard to the care of the poor. In 257, the emperor Valerian began a persecution aimed chiefly at the clergy and the laity of the upper classes. All Church property was confiscated and meetings of Christians were forbidden. The bishop of Rome, Sixtus II, and most of his clergy were executed on 7 August 258, and Laurence on the 10th. This much from the near-contemporary records of the Church. The accounts recorded about a century later by Ambrose (see 7 Dec) and the poet Prudentius say that, as Sixtus was being led to his death, Laurence followed him, saying, "Will you go to heaven and leave me behind?" and that the bishop replied, "Be comforted, you will follow me in three days." They go on to say that the Roman prefect, knowing that Laurence was the principal financial officer, promised to set him free if he would surrender the wealth of the Church. Laurence agreed, but said that it would take him three days to gather it. During those three days, he placed all the money at his disposal in the hands of trustworthy stewards, and then assembled the sick, the aged, and the poor, the widows and orphans of the congregation, presented them to the prefect, and said, "These are the treasures of the Church." The enraged prefect ordered him to be roasted alive on a gridiron. Laurence bore the torture with great calmness, saying to his executioners at one time, "You may turn me over; I am done on this side." The spectacle of his courage made a great impression on the people of Rome, and made many converts, while greatly reducing among pagans the belief that Christianity was a socially undesirable movement that should be stamped out. (1) The detailed accounts of the martyrdom of Laurence confuse the persecution under Decius with the persecution under Valerian, describing the latter, not as an emperor, but as the prefect of Rome under the emperor Decius. (2) We have early testimony that Bishop Sixtus and his deacons were not led away to execution, but were summarily beheaded on the scene of their arrest. For these reasons, the Bollandist Pere Delahaye and others believe that Laurence was simply beheaded in 258 with his bishop and fellow deacons. On this theory, it remains unexplained how he became so prominent and acquired so elaborate an account of his martyrdom. Lawrence's emblem in art is (naturally) a gridiron.